So we've been working on this game for little over a year (started in our last year of Game Design at Wits in 2015). We've had a bunch of people working on the project on and off, but now we're really trying to see if we can finish it. The game is now called Semblance and it's a puzzle platformer where you can deform a play dough world, and mould your avatar. We're also happy to announce @Jelligeth has come on board to the art on the game for the next 6 weeks. We're loving her stuff so far! Current plan is to make a real vertical slice of the game over the next 6 weeks and then go to publishers/investors in an effort to get funding to finish the game :). So @SUGBOERIE, @Sean_Goncalves and Judd Simantov are working on a game called Squeeze Me (placeholder) - it's a platformer about changing your shape and size in order to fit in and find your place in the world. At the moment there are 5 levels. We've playtested it a bit at the Joburg meetup, but this is the first time we're putting it on the forum. It's currently a tech and gameplay prototype - showing some small variations on how the core squashing mechanic could work. If you like the look of it, please give it a play and give feedback on whether you found the mechanic interesting, and how intuitive you found the gameplay and stuff - stuff is always important. We're currently spending a bit of time polishing it up, adding some art and working towards a vertical slice of the game; in addition to lots of mechanics/level element prototyping. At that point, it was really hard for me to become horizontally-flat again because I couldn't get any height to dash up/down. Dunno if seeing this could be inspiration for another puzzle of some kind. Dang! Such an awesome premise :) Can't wait to see what you guys do with this!! @Elyaradine Could be a cool puzzle, yeah! One of things we'll add pretty soon is a platform that stops your movement, but doesn't allow you to squash - which will both make squash inducing platforms a resource, plus avoid awkward situations like that :). One of things we'll add pretty soon is a platform that stops your movement, but doesn't allow you to squash - which will both make squash inducing platforms a resource, plus avoid awkward situations like that :). A super-easy way to communicate this to the player is just to have angled platforms. If the lip on the right there was at 45 degrees it would never squash AND it would help divert the player downwards too. Cool stuff, I played through and saw a decent action platformer emerging. But I feel that the character's changing form is the hook which should separate this from a lot of other platformers, and most of the demo wasn't actually focused around that -- there's been a lot of elements and dexterity challenges that are only mildly or completely unrelated to setting up the current shape. I think that there's room to make squeezing more integral to the action, *possibly* by making the deformation an automatic thingie which happens when hitting a wall or floor (no dash required). Losing this bit of control over the character's malleability may present new challenges and planning requirements in tighter, more puzzle-y scenarios. If we want instances where the character's shape is *not* alterable, there's always the bouncy walls (or soft padded surfaces for when you don't want to be rocketing all over the place). @dislekcia That's an elegant solution! I think we might play around at some point with angular deformations at some point, so don't want to quite try that out yet. @Nandrew Thanks for playing! Totally agree with the observation about most of the demo having little to do with the squashing - it's one of the design problems I'm trying to wrap my head around. Currently I'm working towards most level elements having 3 different responses depending on your shape: tall, normal. long - but I think this is only a minor encouragement for shape changing, it still needs to be explored more. I do like the idea of automatic deformation - and it's one we've discussed before. I think it perhaps does need to be prototyped. I particularly like the subtext it implies of each movement you making needing to be quite decided and certain, which will slow the gameplay down a bit (something I would like). Just chiming in to say I liked how changing shape affected aerodynamics! This a very fun mechanic, I really think you've only scratched the surface of what you can do with a shape changing blob. I managed to finish the game with only two sections giving me a little bit of trouble. I felt it could be a little bit more floaty though. The high gravity made the timing on some manoeuvres really strict. 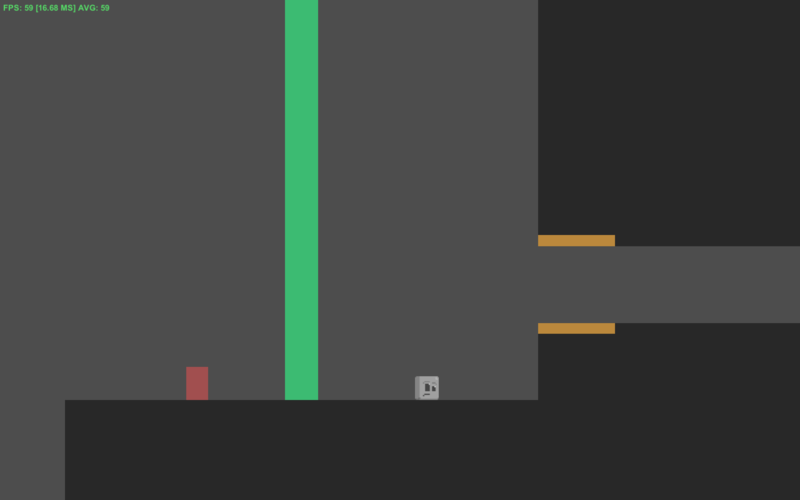 Also, making the objects that can be broken through with dash a little bit more visually distinct, as the colour for the bouncy floor and breakable bouncy walls are very similar. So gave it a go, and it felt mostly familiar to the last time that I played it. But being able to sit down and digest the game has shown me more about it than a quick play at a meet. The puzzle below was rather annoying with the amount of times that I had to reset due to the spikes being right on the edge and sliding on the wall would kill you. Aaaaaand then most of the puzzles after that felt similarly annoying. The game rapidly goes from quirky and interesting to a relentless dexterity challenge, it doesn't use the changing of shape in an interesting manner, but rather it turns the shape change into a means of 'moving to the right' instead of it being the primary means of interacting with the challenges presented in the game. Changing shape is your central mechanic, use it. If I want just for a dex challenge puzzle platformer I'd play VVVVVV, or the myriad of other puzzle platformers that have emerged since Braid. Relying on something other than the central hook of your game to drive interaction is severely short changing yourself. And we know that there is some really cool potential with the game. So I played this recently, played through all the levels and the one thing I couldn't really figure out was where you guys see the focus of this game being. I usually see platformers being some sort of combination of puzzle challenges and dexterity challenges, with games like Super Meat Boy and VVVVV heavily favouring the dexterity route, Braid favouring the puzzle route and something like Spelunky in the middle. Disclaimer here, I'm not someone who plays a lot of platformers, but when I do I tend to games with some puzzle element. Pure dexterity platformers are not really my thing. That being said, if you guys do want to go for a more dexterity based game then I think you should spend some more time really tightening the control scheme. Maybe it's because I was playing with a keyboard, but I felt that I often had difficulty executing on what I knew I wanted to do. This was especially the case for me with the bouncy platforms. On the other hand, if you guys want to focus on puzzles then I agree with what @Karuji was talking about, I would put more focus on creating interesting and novel mechanical interactions. Things like the effect your shape has when floating is a great example of this (although in that particular case there didn't really seem to be a benefit to being thin as opposed to flat in the existing level set). Once again, when I do play platformers I tend to prefer puzzles, and there is potential here for that kind of gameplay. Maybe try exploring more extreme forms of transformations, things like an extremely flat character that can cross chasms but gets blown about at the slightest breeze, or a really tall character that topples easily but can protect something from an incoming barrage of arrows? Round characters that can roll maybe? All in all I look forward to seeing where you guys end up taking this. Good luck! @MCA , @pieter, @Karuji & @Riocide, thanks for another batch of great feedback! <3. @pieter Totally agreed about only barely scratching the surface - sometimes it's tricky to actually get under the surface, though :P.
Which parts did you struggle with in terms of the manoeuvering? @Karuji + @Riocide Thanks for the detailed thoughts! We agree about the changing of shape being the central mechanic - focusing on this is more difficult than it might appear. We're prototyping a bunch of elements /mechanics in the coming weeks :). We definitely want to focus on the type of level elements like the air in the future. If you played the prototype and struggled with the pink bouncy walls by the way: you can actually hold down space and alternate with the arrows in order to bounce back and forth. This makes it much easier to do. This is an interesting little controls education challenge to teach players. 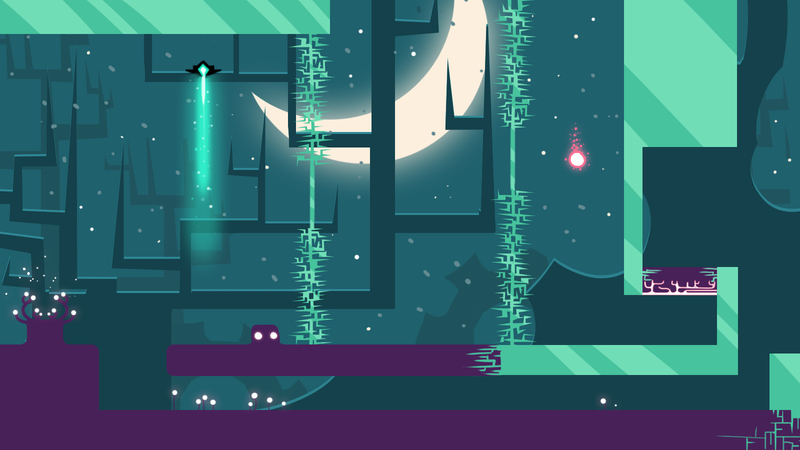 Generally though, we want to reduce the frequency and intensity of dexterity based platforming :). Finally got a chance to give this a go. What I'm looking forward to are really interesting and tricky puzzles. Ones where it takes a good couple of goes to actually get a clue to how to progress. I think giving the illusion of a means to progress would add some depth as well. Awesome! Just played through this. I Like the mechanic and the controls feel great. I also really like the way the camera is handled, as all the movements and zooms felt natural. I really liked how I had to squish flat in order to float on the wind things. I think if you can bring more elements like that into the game it would be really cool. I liked that the squeeze isn't limited to only getting through holes and stuff. I am a fan of platformers and will definitely be keeping an eye on this! Hey guys! Been quite a while since we updated this thread :). We've been working on the game slowly and quickly at the same time. We've done a bunch of iteration based on our own thoughts and all your wonderful feedback :). We've introduced a few new level elements, and we've taken out the dashing mechanic for 4/5 levels to try focus on the squashing mechanic itself. The collisions can be a bit buggy still, so if you find yourself stuck in a wall or something, press A on the keyboard. You can use either the Keyboard or a Controller :). 1. Did you feel the squashing was the focus of the gameplay? 2. Did you find the game more conceptual (figuring out puzzles, understanding how level elements work/interact) or more execution difficult (precise platforming, hard jumps etc)? One of the main changes we made is adding platforms that don't elicit squashing. There are soft and hard platforms. In order to change shape you need to get enough velocity (either through falling or dashing) to bash against a hard platform. Finally got around to this, cool stuff! 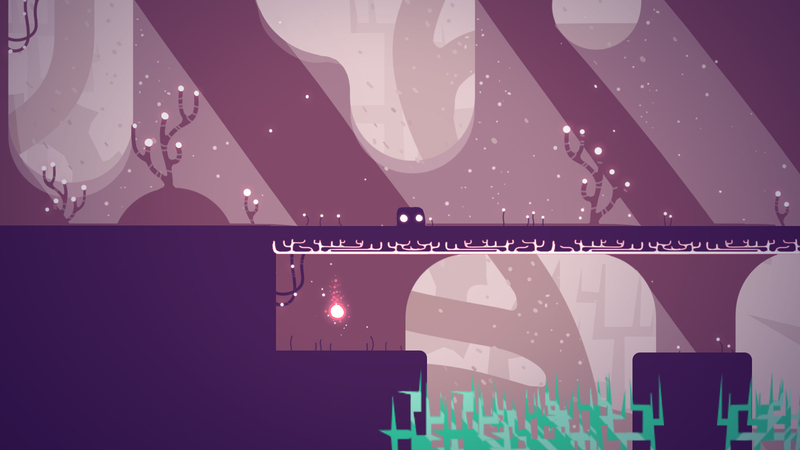 It walked the line in terms of which aspects I found challenging: there were moments of tricky platforming, but I found the puzzle nature of it to have enough of a presence to make me feel clever instead of just dextrous. This is even without the "going too fast = squishdeath" mechanic (which took me a while to accept). I think your camera work is what really nails it. Scoping to include the whole puzzle space in any situation was actually really *valuable* and every time it moved to frame a situation I felt relieved in knowing that my toolbox had been defined for me. Consequently, I felt a little less satisfied when later puzzles seemed to move beyond being solvable in a single screen. The squish-specific platforms seem to be a good move, though they were sometimes challenging to see in contrast to regular platforms. Congrats on getting such an open-world feel, too. I do not know how linear this game actually is, but it felt like I was "exploring". I think I would like to tone down the challenging platforming a bit - in other playtests, it's the only thing that alienates more casual players. Yay! Glad you like the camera work! There definitely are some puzzles later on that need you to look outside the defined area - it was an experiment that I don't think works that nicely. It might be cool to have it once or twice, but having it regularly is confusing. Really happy you felt like you were exploring. I think that was really important for us: if we're making a puzzle game, it's nice to be able to explore other areas and come back later :). At some point we were playing around with making the game a Metroidvania, but i think we've struck a happy balanced of grouping levels together in open-world feeling levels :). If you are looking for more puzzles to solve, you could add the idea of temperature. So for example he gets frozen and can't squish until he finds a place to warm up. Or if he gets too hot he can melt, which allows him to travel down curvy pipes. Hey did you guys lock down music and/or a composer yet? I'm lank keen to work with you on the project if you still have space. Cool tracks would be "Video Game", "Arcade Medley". @mikethetike That's a good idea, and one we've kinda prototyped before! 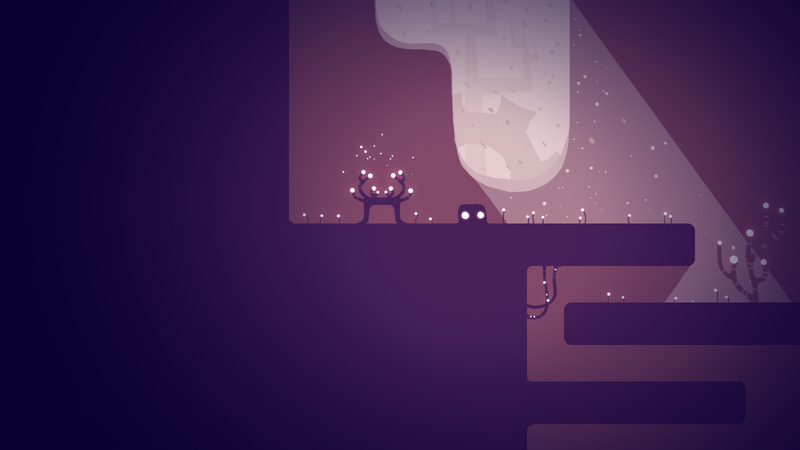 Haven't really made any levels with it, though - think it was a tad awkward, but might come back to it :). @JuicedRobot we haven't locked down music/composer yet, but we're thinking of going with a acoustic guitar kind of feeling. We're looking at licensing some unknown musicians music, like this wonderful stuff.. We'll probably work with a local musician to do some filler stuff, but at the moment we're looking for folk acoustic stuff :). @Zaphire Thanks for the blunt feedback :') :P. Do you have any examples of games that are similar to ours? We were on the lookout for stuff that was similar during the weekend, but couldn't really find much - would love to have them for reference :). Apologies if it was so blunt :P I will check around again and link all of those here because you might be able to steal some ideas. Was almost 100% same idea with squishing etc. Keep up the good work. @Zaphire We looked through a lot of Ludum Dare stuff and we couldn't find *that* much stuff that was similar :). The only one we found was Size Matters which is pretty cool. We've started working on deforming/changing the world as well as your own character now. Here's some hacky implementations of how that might work mechanically. Here's some art directions we're testing out too. There was about 4-5 games I saw with similar mechanics. Will have a look when I have time but I have to say that the art direction you are taking for your game looks fantastic! I absolutely love this concept and art style. This is looking great! I see you guys are thinking of using an acoustic soundtrack by recording a South African artist. Please excuse me while I throw some ideas your way :). The reference you posted is an awesome track, and something similar could be used for the narrative/story parts of the game. However, I would caution using recorded guitar pieces as your standard gameplay tracks. There's a big possibility they could end up being more "wallpaper" tracks than a sound that merges with the game and draws the player in. In other words, recorded guitar tracks would sound like you're just playing a pretty good acoustic album in the background. If this is a project where you guys really want to create an emotional attachment between the character, the world and the player, please take a moment to rethink your approach. This could be something special! We run a film music composition studio in Cape Town and know some of the most talented musicians in South Africa, have recording booths and top of the line equipment. Are looking to collaborate on a indie game project with other South Africans in our spare time. Would love to have a chat about how to create an audio landscape that would draw the player in. P.s I'm new to this forum so please excuse my forum etiquette. So excited to have found this place! Also glad to hear your feedback :)! Just catching up here, some nice ideas! Character deformation is a neat thought, but now the world deformation sounds like a very exciting/fertile concept to marry it to. I'd be very happy to see this idea being explored more. I'm liking what I'm seeing! I've just joined the community and this is the first prototype that I've played on here. You've had some valid comments from previous members, so I'll wait until your new version is released before giving feedback. So here's that new playable build! Still some basic art stuff missing, but the gameplay has taken a new direction ^_^. Would love any feedback you have! 1. How do you feel about the deforming mechanic? 2. Where did you stop playing? Why? Did you become frustrated/bored? 3. Did you feel the game showed too much, or not enough potential of the deforming mechanic? Would you want to play more of that gameplay? In the picture below Im not sure it was the correct way of getting that yellow ball but I could not get into that gap no matter how hard I tried. 1. Deforming mechanic was nice when I used it to cheat my way to the yellow orb twice. Think it needs some rethinking on how to make it better because it didn't feel very much in place with the mechanics yet. 2. Think it was stage 4. Was very similar gameplay all over with slightly more difficult scenarios but I was also quite a bit tired. 3. I think the game as is was quite good but it needs some real polish. It wasn't so exciting but I think with better effects it would look much better. Examples could be when you hit the ground have some impact particles show up etc. Thanks for bumping. I've been pretty busy recently and have a backlog of stuff to play through, and then lose track and forget. I just want to start off by saying I'm pretty sensitive to getting motion sick. :P And just typing stuff as I play first, then address your questions more at the end. I like the deforming. The way the character bounces around and stuff, I start to expect him to deform to things too. His jiggles and wobbles make him seem pretty soft and jelly-like, so I expect for him to look as if he's flat against walls when you're just pushing into walls. Where you have rain, you've got these nice streaks coming down from above. I feel that, when it's raining, it's generally unlikely for there not also to be some wind. (There's all that changing of temperatures and pressures going on.) If the rain doesn't have a special reason for being purely vertical, I'd suggest making it fall at an angle. The drops themselves seem to be blocks as opposed to streaks, which makes them read as hail rather than as rain drops. I don't know if it's placeholder, but the hard grey blocks sometimes read as empty areas, or aren't easily visible against some of the darker background colours. When there are orange spikes, it's not always clear how far they extend. I've found myself dying while feeling like I didn't actually hit them. I think in general, I'm finding that if I go where I'm "supposed to" go, the camera seems to behave quite well, but the moment I'm exploring something, just jumping around, sometimes moving backwards, the camera's moving back and forth can make me feel a bit queasy. Perhaps there could be a bit of a deadzone, so that the transition doesn't just happen at a specific position, but that you've got to move a fair amount further to make the camera move back to a previous position. There's a camera movement that happens when you dash into the ground. It's nice in the sense that it gives some oomph to the collision with the ground, but I think it's quite slow, and also made me a bit queasy when I jump-down-dashed repeatedly (to try and change shape). I think it'd be better as a shake that doesn't move quite as far, and stabilises very quickly. There were a couple of puzzles that had a breakable orange platform above, and a coin above that, and spikes above the coin. I found it quite difficult to gauge how to control my dash-jump, and often just dash jumped upward again and again and again until I somehow got the coin without hitting the spikes. It didn't feel like skill (my timing felt random), and it didn't feel like learning (I feel like I knew what I had to do), so it was a bit frustrating. 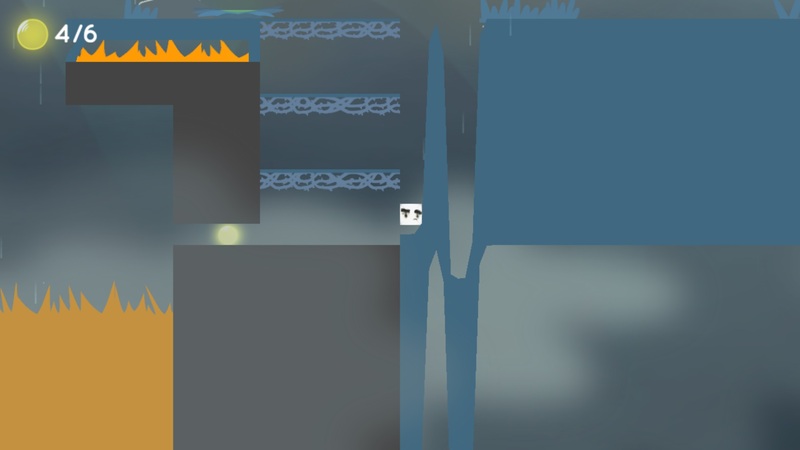 After [spoiler]the area where there are orange spikes with a gap underneath them where you knock the ground up to give you platforms to jump across[/url], completing that part of the level ended in a black screen that didn't take me to the next level. Like, I can see how it currently seems to be about deformation (change yourself to reach your goal, or change the world to reach your goal), but I've definitely seen players-can-change before, and also seen bouncy or deforming walls in other games. I think the challenge here is to introduce something novel as a hook. I feel like there are glimpses of this (the idea that your shape would affect your air resistance, allowing you to glide or jump super quickly -- I don't think that's been done much if at all -- was pretty cool), but I haven't yet reached the point where I've felt excited about playing it. I really like how the controls feel. I like the dashing. I like the jiggles. I like the parts of the environment that don't feel like they're just blocks. I'm personally just not enjoying the "puzzle" platformer part of it much at the moment, but I'm not sure what to suggest. Maybe if there were much more extreme ways to deform things, with more extreme consequences? (Are there other cool potential consequences aside from air resistance?) Maybe if it's more of an action platformer? (I have no idea.) You guys are awesome, and I know you're capable of great things. I've given this a shot. Deformation is totally plusplus. I stopped playing, I think, where @Elyaradine mentioned the black screen (I got fade-to-black that didn't return). A shame, because my interest level was starting to rise. A more drawn-out introduction to that concept may be useful -- my impressions were already "spoiled" by knowing what was coming through the gifs you've posted, but normal players may have trouble with the initial request to wall-dash-to-make-intermediate platforms vibe, I found it to be a moderate dexterity challenge out the gate. To start off, just wanna say that I'm generally horrible at playing puzzle games, also I don't play dash type games, so even the basic concepts here are somewhat new to me from a player's perspective. 1.Deforming is great, there should be more of it. 2.I got stuck at the green pillar of light, after about 5 min of trying to get past and encountering a few bugs when trying something novel, I quit. 3.I didn't play enough to answer this. I've already sent my feedback (ingame feedback button was nifty :), but I just had a thought. In an attempt to make the execution part of the game a little easier, why not reduce the gravity. Jump and air movement velocity would obviously need to be adjusted, but giving the player more hang time might give them that extra second to pull of a tricky aerial manoeuvre. I had a lot of fun with the game though. Managed to solve every puzzle (hopefully how you intended) and only got stuck in the floor twice. The difficulty curve for the puzzles did not always feel linear however. I fully understand that this will vary for each player but here were the ones that felt more difficult for me. - The one Zaphire mentions above, where you have to drop towards the spikes, dash up to become flat and then keep moving right to slide through the gap. 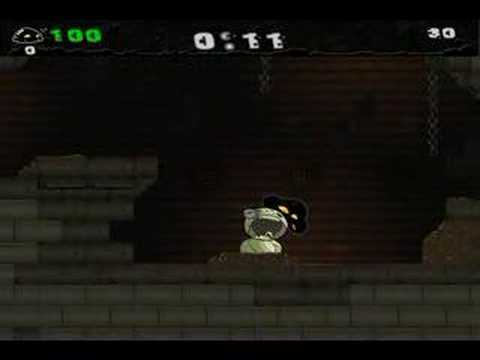 - Any puzzle where you have to notch into the walls to do a "wall jump" of sorts. Often found myself falling instead of jumping from a notch. By no means remove them, I love me some high execution based play. Maybe there is an opportunity to split puzzles stages into [Puzzle] and [Execution]. Execution based stage could be great for speed running. Thanks for the feedback! Sorry I was delayed in responding! @Zapphire Definitely needs more graphical polish! As a puzzle game it can definitely get frustrating - we one to mitigate that by at least having an overworld so you can jump between puzzles :). Yeah that puzzle is pretty hard to execute on. Good job on getting down there though - must have taken a while to deform that low XD. Designing the puzzles can be super difficult because you're not used to thinking about the world as this deformable thing. Good point about the rain - think it was just a hack that it was purely vertical. Yup blocks of ground are placeholder - mostly because we're just figuring out how to do texturing on stuff that deforms. The camera quesiness is definitely something we'll refine. Need to give the camera motion generally another pass :). The dashing actually has this weird inconsistency bug that we haven't quite figured out :/. So that's why it probably felt confusing. The black screen might have just been a load time thing. The final level is quite a long one, and I did some hack coding that we just fixed which was making the load times long. Shame you got stuck there - the final level has some of the more elaborate puzzles that start to push the deformation :). We've definitely got the feedback that the game lacks a hook from other people. It's definitely something that we're working on conceptualising at the moment. I think the deforming world might be it, but we generally need to make the material feel more squishy before that makes sense. We spend a lot of time on Steamspy :D. It's interesting that you say you've seen the deformation before, because some others have said that, but I haven't really seen other games with it? The only game that seems to have pierced the mainstream is The Floor is Jelly? And even that didn't sell hugely well. I think we're hoping that the deformation will be our hook once it's more refined, but we're going to explore other options. The shape-changing stuff was the core for a long time, but it was super slow to find content for it - I'm just not sure there's enough there to work with. Comparitively, the deformation stuff has yielded much more mechanics content in a much smaller time frame - which seems like a good sign? I'm not sure. Interesting that you're not enjoying the puzzle platformer part. I kind of want to avoid action-platforming because I feel that's quite a saturated market. 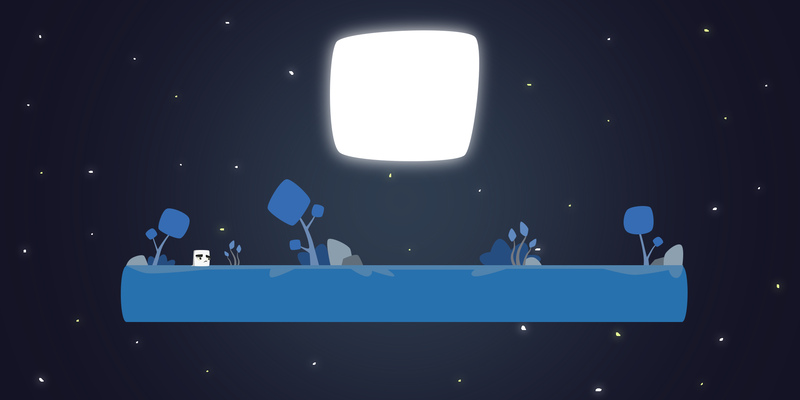 I think there's not enough framing around the game yet for it to work at a meta level, as a good puzzle platformer. I think it needs an overworld, some motivation to finish puzzles, and the ability to come back to puzzles you struggled with. Glad you enjoyed the deformation stuff! I also thought about taking the character deformation stuff out, and I'm still thinking about it. I do like the tension it offers though. It feels cool to have to deform the world in order to change your character sometimes. It would definitely be more elegant if we went without it, but I don't know if I'm brave enough to try make content without the character-squashing XD. Think I should probably take some time to prototype some levels in that style. Thanks for playing! Great to hear your perspective as someone from outside the genre :). Collision check on the spikes is a bit cheap. We still have the box collider for the whole area for checking if you should die. It definitely leads to confusion. That teaching where you got stuck is definitely awry. It's not even supposed to be a puzzle. You should try dash against the black/grey material there to change your shape. That will allow you to go up to that area. @pieter That's a good idea! I think it might come to a style thing, but I generally prefer high-gravity platformers. Prefer the motion it brings! :D I think I'm tending towards, at this point, mostly taking out deterity stuff though. Is just too annoying. Might have some special collectibles that have dexterity challenges maybe :). There's a bunch of 'bad' ways to solve most of the puzzles, so you probably broke a few :P.
The wall jumping isn't quitttte there. It's still a bit annoying. It shouldn't be a dexterous thing to do. A couple more iterations will make it feel solid hopefully :). Yup, was thinking exactly this! Will probably sprinkle some execution challenges into the levels. But they're not mandatory to progress :). I think I'm tending towards, at this point, mostly taking out deterity stuff though. Is just too annoying. Might have some special collectibles that have dexterity challenges maybe :). So we've been working on this game for little over a year (started in our last year of Game Design at Wits in 2015). We exhibited the game at EGE and A MAZE. / Johannesburg and we were happy with how people received the prototype, so now we're really trying to see if we can finish it. @SUGBOERIE and I are the core team, with a couple other collaborators. There's a nice video on Twitter of some more of the world deformation gameplay. 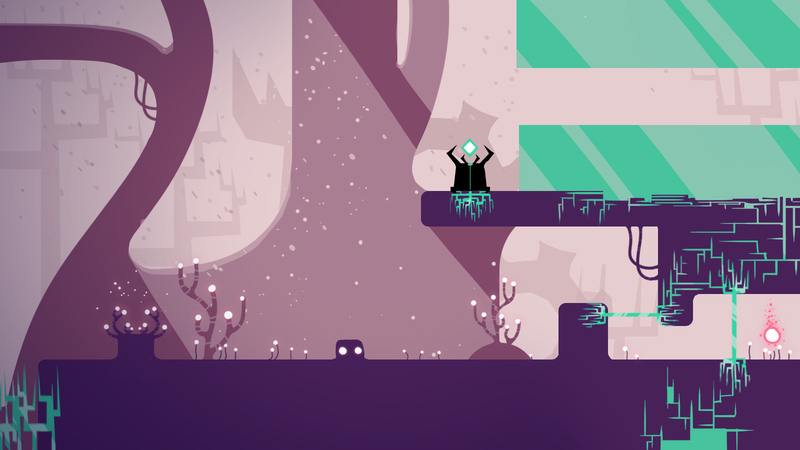 The backgrounds are looking so beautiful! Was speaking to some guys on Discord and this game came up, from around ~2004, instantly made me think of your game. Thought you should know about it, maybe there is something interesting for you there. @critic Yeah a bunch of people have mentioned it before, but I only recently looked at it myself :). I think it's interesting, but for the most part the softbody stuff just looks aesthetic - there's not *too* much actual gameplay coming out of it. We got featured on Ars Technica today as the lens through which they covered A MAZE Johannesburg. WE SHOULD JUST SHIP IT ALREADY. @blacksheepZA Yeah we love The Floor is Jelly! It's one of our favorite games ever :D.
This game is kinda a response to the way Ian Snyder, the game designer, used the jelly mechanic in the game. For the most part he just uses it as an interesting platforming variation. He uses it some super cool ways in places, and that's the sort of stuff we wanted to expand on :). We're pretty close to having the new art style implemented with the gameplay we have. Will post a demo real soon!